Good news for T-Mobile customers looking to upgrade. 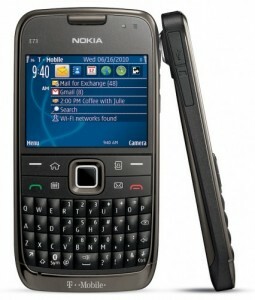 As Nokia’s presence in the US market increases adding E73 to its list only makes it look good. Nokia’s brand new smartphone the E73 will be launched by T-Mobile USA on June 16th. The E73, a variant of E72 has a full QWERTY messaging phone comes with WiFi, 3G and a nice 5-megapixel camera. It also supports apps from Nokia’s very own Ovi Store and Ovi Maps for navigation with free turn-by-turn directions. It makes the whole deal a lot more nicer by providing built in support for VoIP over WiFi and a browser that supports flash. With its launch with T-Mobile USA on June 16th it is set to compete directly against other major players. It is reported to be priced at $69.99 on a 2-year contract with T-Mobile. Adding to that purchases made through the Ovi Store are supported by T-Mobile too making it easier for users.